How can we cut enough coal to get to 1.5? - Unearthed How can we cut enough coal to get to 1.5? On coal, the IPCC couldn’t be more clear. In order to have any real chance at staying under 1.5 degrees, global coal power use has to fall by ⅔ by 2030 and almost fully phased out by 2050. But how can we achieve such a gigantic feat? According to a new report – courtesy of Greenpeace and CoalSwarm – it can be done. The world must (a) stop new coal plant projects (b) reduce the utilisation of existing coal plants and (c ) close them as soon as possible. This may sound straightforward but it in reality it is anything but. All coal plants in the pre-construction phase are cancelled. Existing coal power capacity is cut in half by 2030. A full-phase out in OECD countries by 2030. A near-total global coal power phase-out by 2050. 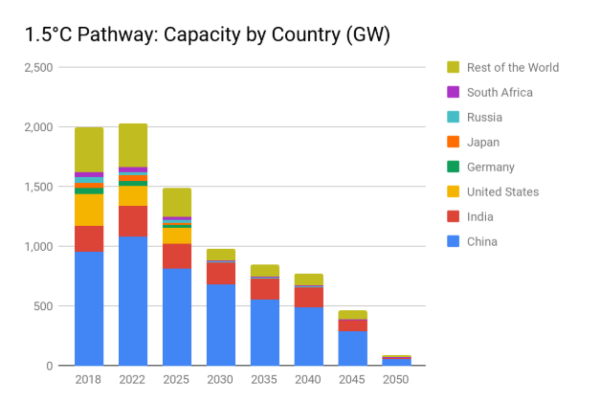 The current rate of coal power plant retirements would need to multiply by 2.5, which some countries – such as the UK – have shown is possible. It would, however, require unprecedented and radical global political commitment to doing that. Economically developed countries, which have older coal fleets, must take the lead in the move away from coal. The IPCC global coal reduction rates for 2030 are so large that they require the OECD countries to fully phase-out their coal power capacity by 2030. This means a major policy change in some leading industrialised countries, particularly in Germany, Poland, South Korea and Japan. These countries still invest in new coal projects and plan to use their coal power plants for decades. In a world trying to stay under 1.5 degrees new coal plants become a financial liability and existing plants a political burden. With climate policies increasingly focusing on decarbonisation, a planned-in-advance phase out is easier to manage than a sudden collapse. 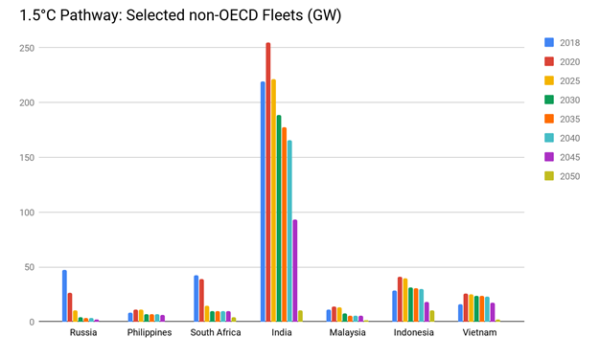 Phasing out the OECD coal power plants will mean average levels of retirement of approximately 47 gigawatts (GW) per year, which is significant increase of present rate but not out of reach. 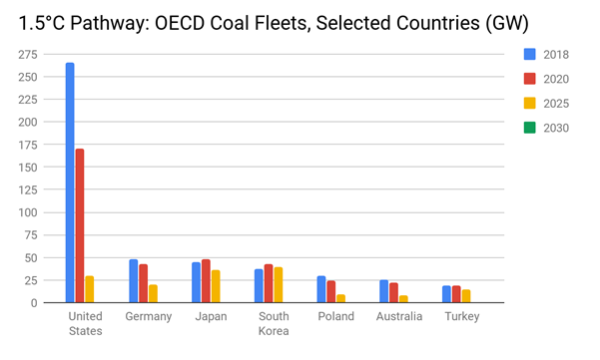 Outside the OECD, China and other non-OECD countries will also need to reduce their coal fleets by 2030. In order to do what the IPCC says we need to do in terms of our coal use, plants built before 2008 will need to be shut down in the non-OECD countries by 2030. Even deep cuts in coal power capacity need to be made by 2030, beginning with the older power plants, with an almost complete phase out by 2050. 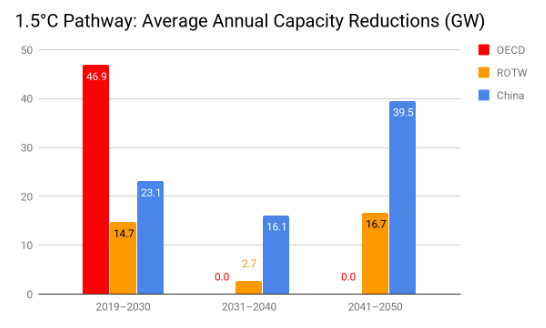 This reduction is a significant challenge but the transition will be made easier by the continued steep decline in the cost of wind and solar power. Some of the coal power capacity in Asia is now being retired early because it is no longer cost-competitive with renewable energy. Globally this level of plant retirements amounts to a coal power capacity reduction of 5.75% per year from 2019 to 2030. This is faster than the rate of contraction of the U.S. coal fleet from 2006 to 2016 (1.59% per year) but slower than the average rate of contraction of the UK coal fleet over the same period (7.21% per year). In this analysis the coal power plants are assumed to be retired in order of age. It also gives insight into what is the age of the plants when they are shut down. One take away is clear: the faster countries and companies stop projects, the less stranded coal power projects there will be. If all coal power projects in pre-construction are cancelled, the analysis shows that youngest coal power plants is being shut down is about 22 years old. In light of this one key takeaway is that a global coal phase out plan can create less stranded coal power assets, and thus less political and financial barrier than sometimes assumed. In addition to retirements, our surviving coal capacity will need to be used a whole lot less. As coal has been competing with lower costs of renewables, challenged by air pollution regulation and water shortages, higher cost of co2, coal plants have been pushed back from their baseload position to balancing roles. The capacity factor of global coal power plants has been steadily been lowering from 65% to 52 %. The analysis assumes an average load factor of the global coal power fleet to decline at a rate of 3.5% per year, from 52.5% in 2018 to 16.8% in 2050. This rate of decline is slightly lower than the rate of decline seen over the past decade in the U.S., where the coal fleet’s average load factor dropped from 73.6% in 2007 to 53.1% in 2016, a 3.6% average annual reduction. Retiring coal capacity would also bring major health benefits by cutting air pollution, especially in Asia. 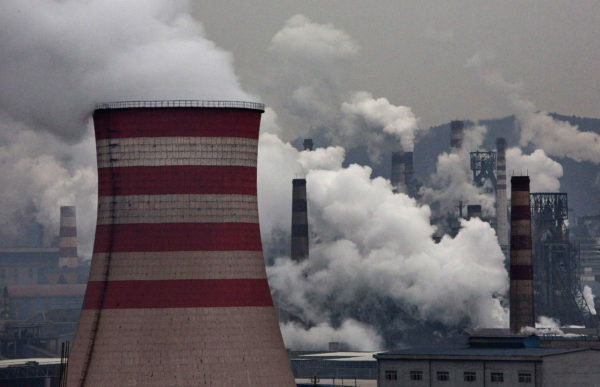 Coal power is causing hundreds of thousands of premature deaths annually. Phasing out coal would also ease pressure on fresh water sources. It’s estimated the freshwater used by the world’s coal power stations would meet the basic water needs of more than 1 billion people. But the mainly let’s do it because of stopping climate change demands it.